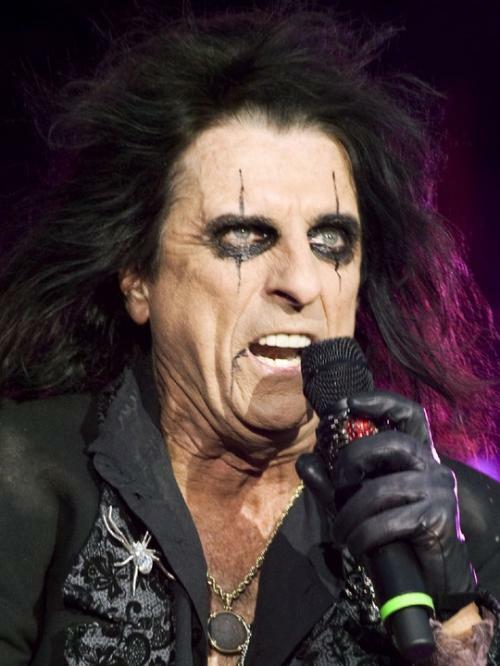 Lay off the Candy, Alice Cooper! Husband and I were having a conversation at the dinner table tonight about a band that we are going to see with some friends next month. The band, Roger Clyne & the Peacemakers (the lead singer was in the band The Refreshments prior to this), is one we have enjoyed and seen many times prior to having kids. Apparently this is the twentieth anniversary of The Refreshment’s rather popular album Fizzy, Fuzzy, Big & Buzzy. Because of this, The Peacemakers are going to release one song off this album each month with a guest singer. The first song, Banditos, will be sung with Alice Cooper, a friend of Roger’s and a local of Phoenix. Just a short time before we left Phoenix to move to Washington, we saw The Peacemakers play a gig where Alice Cooper got up on stage and sang a couple songs with them. From what I remember of it, it was pretty cool. I may have had a beer or two so my memory is not clear (and it was a long time ago, just saying). Husband made a comment that he thought it was pretty cool to see Alice perform, especially since he rather expected him not to live much longer. What was left unsaid, since both Husband and I knew it, was that Alice Cooper partied hard and perhaps did not take as great a care of his body as he should have. Carter did not know this. And why should he. So he asked Husband why he thought Alice Cooper would die soon. Husband was busy talking with Cody about something so I told him it was because Alice Cooper did some unhealthy things when he was younger and that he did not take good care of himself. Carter thought about this for a few seconds and then asked what exactly did he do that was unhealthy. I was forming my words carefully before speaking when Carter piped up. Jolly Ranchers, Snickers, Mars Bars, Payday, Skittles – mine all mine!!! Yes, Carter, yes he did. Among other things, I am sure. This entry was posted in Random Thoughts and tagged Alice Cooper, Children, Conversations with Kids, Family, Humor, Kids, Life, Roger Clyne & the Peacemakers, The Refreshments, Too much candy. Bookmark the permalink. 7 Responses to Lay off the Candy, Alice Cooper! Gotta love innocence. Great post. I love that! I better stop eating the Christmas Hershey’s kisses or I may end up looking like Alice Cooper, too. LOL! Dang, but if my kitchen cabinets look like yours, all filled with Christmas Hershey’s kisses (among many other treats). I find myself snitching them and packing handfuls of them in my lunches. Who knew what consuming too much candy would do to you? Alice Cooperitus: the ingestion of too much candy resulting in the propensity to bit the heads off bats and to paint your face in an outlandish manor while singing heavy metal songs at the top of your lungs. Life is so uncomplicated when seen through a child’s eyes. If only we could retain at least a bit of that freshness in our thoughts as we move forward in life ! Yes indeed. I love that simplicity and innocence.